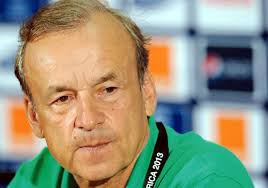 As against what is the norm in coaching the Nigerian national team, new German coach, Gernot Rohr has decided to stick with the old order for the Super Eagles first game under his tutelage. Nigeria take on Tanzania in a “dead rubber” that the Nigeria Football Federation’s Communications department says will hold in Uyo. However, there were not too many changes to the national team as Nigerians know it. Ikechukwu Ezenwa, Daniel Emmanuel, Chidozie Awaziem, Jamiu Alimi, Abdullahi Shehu, Musa Muhammed, Kingsley Madu, Wilfred Ndidi, Imoh Ezekiel and Victor Osimhen are the only players called up who before now have not had a regular run in the team. Ikechukwu Ezenwa of FC Ifeanyi Ubah and Daniel Emmanuel of Rangers are certainly in the team because of their superb showings at the LaLiga tour and Olympic Games respectively. Center back, Jamiu Alimi who plays for Kano Pillars was also awesome against Valencia, Malaga and Atletico Madrid on the tour. Gernot Rohr has invited 23 players, including Captain Mikel John Obi and goalkeeper Carl Ikeme and he apparently does not want to upset the balance in the team ahead of the more important World Cup Qualifying games that start in October. In Carl Ikeme, he has a goalkeeper who is big, strong, and confident and has carefully continued from where the legendary Vincent Enyeama left off. Ikeme would have no time to be lethargic as the duo of Ezenwa and Emmanuel already seem ripe for a starting shirt as proved in their recent outings with the NPFL All Stars side and Olympic Team respectively. William Troost-Ekong is back in the team on the strength of his showing at the Olympic Games, while injury plagued Leon Balogun would be an asset in right back. The Super Eagles have not had a right back of reputable quality since Joseph Yobo last played in role in 2002. And with the duo Kenneth Omeruo and Godfrey Obuobona left out of the team, Jamiu Alimi has a chance at a starting shirt in the game. Unless something extraordinary happens, it seems Rohr will stick to Mikel Obi and Ogenyi Onazi marshalling the midfield leaving Wilfred Ndidi to understudy his more experienced colleagues. Israel –based Nosa Igiebor has not played for Nigeria in more than two years and this may be a chance for him to get back into reckoning. Vice-captain, Ahmed Musa may just retain his place on the wings alongside Moses Simon who was very regular under Sunday Oliseh. And if Rohr decides on a big man upfront then he surely has a decision to make between Odion Ighalo who was Nigeria’s top scorer in Europe last season and Brown Ideye who has done well for himself since moving to Greece last year. But if he decides to start with two front men, then these two may get the nod. Kelechi Iheanacho will of course be lurking in wings for a look in. Gernot Rohr has the best of talent Nigeria has to offer but it remains to be seen what he can do in five or six training sessions before the game against Tanzania. Good thing the game against Tanzania means nothing apart from just being a bonding session for the lads. The test comes up with the World Cup Qualifiers a month later.